﻿This corner of Spain, the Marina Alta, is characterised by the Mediterranean sea and above all by rugged mountains which reach down to the coast. Scattered among our mountains are the remains of a particularly large number of castles, towers and fortifications perched on small peaks and elevated rocky outcrops. Most are badly ruined, consisting only of parts of walls, water cisterns, and not much else except shards of pottery on the ground. What are they? Who built them? Few of these castles have been properly excavated, but archaeological evidence reveals that most were founded during the Islamic dominance of Spain between the 8th and 13th Centuries, a period of five hundred years when this eastern part of the peninsular was called Sharq alAndalus., and the mountains of this region known as Yibal Balansiya. There are few surviving records of life in these rural areas from those times, and historians have had to rely on documents from after the Christian reconquest. A clue as to the importance of the Marina Alta castles and their lands is that they appear in the 1245 Pact del Pouet (the Treaty of the Well) - unique in that it was written in both Spanish and Arabic - between the conquering Christian King Jaume I and Muslim war lord popularly known as Al-Azraq. The power struggle between these two is the basis of the "Moors and Christians" festival – but that is another story. An important thing about the treaty is that it is the first written record of these castles, their earlier history being undocumented. The castles are mostly located on rocky pinnacles overlooking valleys and natural routes, often close to good water sources such as springs. Elsewhere near the farmsteads (alquerias) there are the remnants of isolated square watch towers (atalayas). The thing that intrigues scholars is that there is a very high concentration of Islamic castles in the steep Alicante mountains as compared to the rest of Spain. Although this density of fortifications fits the with large number of rural communities. Timeline - Click on the image to enlarge it. 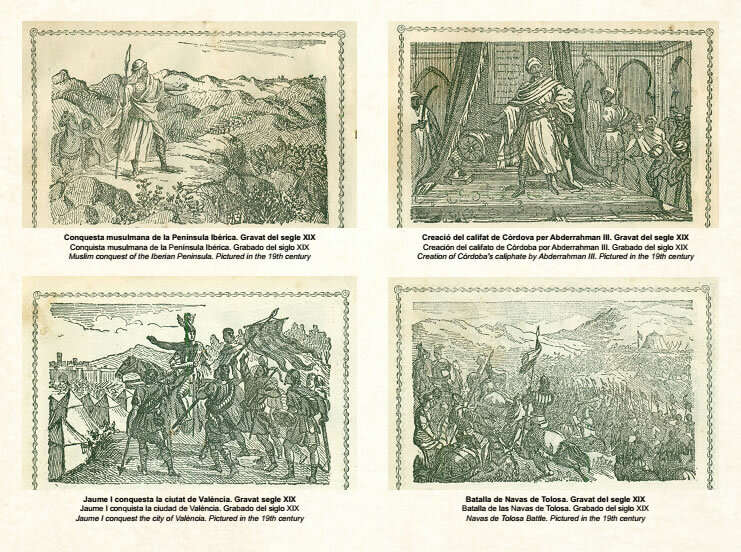 Early days – the Caliphate: In 711 a raiding force of 1700 men serving the Umayyad Arab caliphate in Damascus (Syria) entered the Spanish peninsula via Gibraltar meeting little resistance. In the following year thousands of reinforcements arrived and in 714 Valencia fell without a fight. In 756 Abd al-Rahman I arrived in Cordoba and established an Emirate which was politically independent from Damascus. In 929 Abd alRahman III proclaimed the foundation of the Caliphate of Cordoba and himself as the head of Islam in Spain. 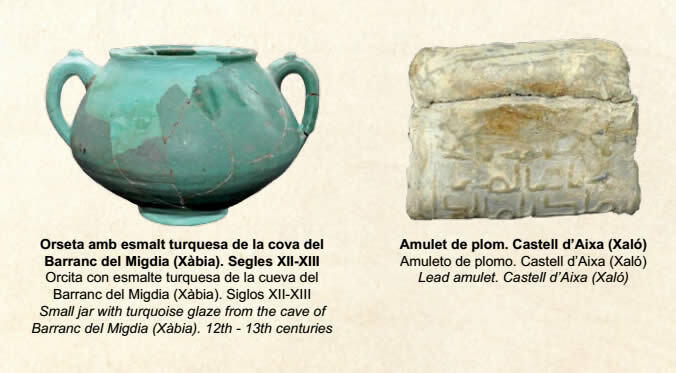 There are few early Islamic remains in the Marina Alta. This late settlement is probably linked to the general de-population of the area which occurred after the decline of the Roman empire. Although there are some intriguing ancient sites such as El Cocoll, the earliest confirmed finding of a fortification in this area is the military fort of Almiserá or Xillibre, built around 920 (some 200 years after the invasion) probably to aid the Cordoba government to suppress troublesome Berbers. At this time, Denia existed merely as a port or dockyard without any urban development and was dependent on the town of Ondara. In the mid 10th century Denia had become an important port and one of the three dockyards harbouring the caliphate fleet between Almería and Tortosa. Small dominions - the Taifas: In 1009, a period of instability and civil war known as the Fitna, led to the collapse of the Córdoba caliphate, and the establishment of small, independent dominions known as taifas. Denia taifa was founded in 1014 by Muyahid, a high functionary of the defunct caliphate. Under his rule, and that of his son Ali ibn Muyahid, Denia was converted into an important administrative centre, its scope of influence including Orihuela, Alicante, Elche, and Cocentaina, with the Balearics being politically dependent. It attracted artisans and artists and became an important trading post in the western Mediterranean. During this period, the city became enclosed by walls and the castle began to be fortified. ﻿﻿The Taifas collapse and the arrival of the Almoravids: However, towards the end of the 11th Century the taifas warred with each other and with the Christians. In 1076 Denia taifa became part of Zaragoza; in 1092 the Almoravids (a Berber dynasty from North Africa) annexed Denia and eventually took over all taifas incorporating them into their empire. In 1094 the Christian El Cid took Valencia, holding it until his death in 1099, and imposed high taxes which helped to unbalance what was left of Denia's prosperity. In 1102 Valencia fell to the Almoravids. Almohad rule: In 1146 the Almohads (a competing Berber dynasty and sect) overthrew the Almoravids and in 1177 established a government in Seville. Under the Almohads, rural society was once more structured and organised into districts which were in turn dependent upon cities such as Denia. They built a series of military watchtowers to better protect the people. New villages were founded in previously uninhabited areas. Artefacts found in this area show that the Muslim people living here had a North African culture, and it is quite possible that the numerous towns and villages with names beginning with Beni (son's of) were called after the Berber clans which founded them. the sparsely populated Alicante mountains where they built fortified refuges. Archaeology will test such theories, and no doubt change the historical narrative. The Christian conquest. In 1238 Valencia was conquered by Jaume I and Denia fell in 1244. The Alicante mountains and all the castles were briefly controlled by Al-Azraq through the treaty of 1245. But the Christian king took the territory in 1258. There were other Muslim revolts in 1276-77 which were very quickly put down and soon the entire area came under feudal Christian control. Today, the often unimpressive ruins of the the Islamic husûn/castles and atalayas continue to hold the secrets of their origins and uses, waiting to be unlocked by archaeologists.